Use Beckson's Siphon-Mate pump to siphon oil, diesel fuel, and water. 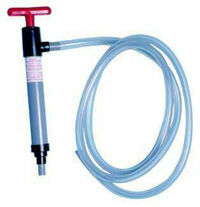 No more dangerous mouth-initiated siphoning with the associated risks of ingesting dangerous chemicals. A few half-pump strokes will get fluid moving, and full pump strokes initiate siphoning. Pump comes with clear PVC tubing. Cut tubing for desired length of intake and discharge hose. When finished siphoning or pumping any flammable liquids, be sure to drain pump of liquid before storing. Do not use with fluids over 120 F (49 C) or with solvents that will attack PVC. 11 1/2 inch long 1 1/4 inch diameter. For oil, diesel fuel, water, boat, home and car. Lifts 8 ounces of fluid per stroke. Three-foot outlet hose reaches containers on the ground. Six-foot hose reaches into vehicle tanks. What is the diameter of the intake hose? yes, I used it to pump about 35 gals of ethanol gas out of the tank on my boat so I could put in non ethanol gas. I pumped it into gas containers. It worked great. YES. IT WORKS FOR ME. Yes, but use extreme caution! Gas vapors are explosive. Store pump outside till all vapors evaporate. Do not store on boat until pump is dry. Yes. I purchased this Pump to transfer gasoline to/from a portable generator, a motorcycle and 5 gal containers in my garage. It works very well if used as directed. Hello MarthaThat what I purchased it for but have not used it yet, so I don't think that I can be a judge. Yes you can. I use it to siphon gas from my generator to a gas can when storing the generator for prolong periods.While the siphon does not get extented use I have been very pleased with its performance. This product would be perfect if the seals are not lubricated with grease which I do not think they are. The unit appears to be sealed so confirming this would be difficult. Just rinse with clean water and don't use pump for gasoline. Ha,Ha. Very useful for draining fuel. Takes a few minutes to get it going but once its starts flowing it works great. Simple to use, works great. Seems like it's quality built, only time will tell. Have transferred quite a few liquids w/ no issues. Once flowing, you can get gravity to do the work for you. JD had best total price. This siphon product works well. I used it to remove contaminated diesel fuel from a tractor fuel tank and it worked as was expected. I do think it was a bit highly priced. Non-marine use for refilling auto transmission fluid which must be done from below vehicle. After going through two plunger-style suction pumps where you get more ATF on you and/or the floor than in the transmission, the Siphon-Mate makes the transfer from gallon containers to transmission without spilling a drop!! And, it does it in a fraction of the time! Obviously a great addition to any engine room or wherever reasonable quantities of fluid transfer must be completed.